I love stepping into places that instantly feel like home, warm and sweet. 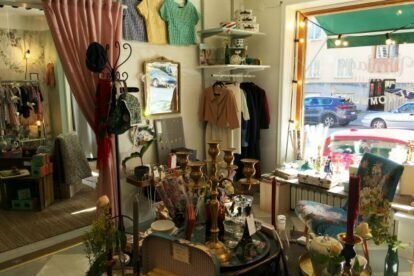 When I first walked into Vintagefabriken, I felt like walking into a homey, heartwarming, frosted cupcake. The feeling hit me like a Miley Cyrus-wrecking ball – in a good way! This small boutique neighbours with Svenska armaturer and Dunke design, all part of the small cluster of worth-visiting spots around Skvallertorget in Midsommarkransen. Vintagefabriken stocks hand-selected vintage clothes and items, original prints, posters and things that in the-little-mermaid-lingo simply would be classified as thingamabobs. Small teacups share a shelf with handmade animal paper ornaments, and on the other side is a rack of Audrey Hepburn-styled dresses in various colors. If you’re looking for cute gifts to bring back home, either for you or a loved one, it’s a sure bet you’ll find something to your liking here. I recently fell in love with a set of Cavallini-posters with painted birds and botanical motifs. If you’re staying in Stockholm for a longer time, Vintagefabriken also arranges courses in photography, origami, interior design and how to create vintage hairstyles. They’re also open for bookings of bachelorette parties. In short, Vintagefabriken is a sugar-wonderland for your quirky shopping-sweet tooth.